CHAPTER 1 AUSCHWITZ EXPLAINED BY THE REVISIONISTS — ‘Vergasungskeller’: gassing cellar or gas-generating cellar? The article by Robert Faurisson that appeared in “Le Monde” of 29th December 1978 on “The problem of the gas chambers” or “The Auschwitz rumor”, triggered a response by G Wellers, entitled “An abundance of proofs”. This was followed by the publication of “A letter from Mr Faurisson”, in right of reply, and by virtue of this same right, G Wellers replied with a text entitled “An inspired novel”. Still not admitting defeat, Faurisson sent yet another reply to the newspaper, requesting “One proof … one single proof”, which the editors of “Le Monde” refused to publish. This epistolatory duel in the press was the start of “The Faurisson Affair” in that it brought the question to the attention of the general public. Keeping strictly to German source documents, Georges Wellers counter-attacked using only ONE LETTER, that of 29th January 1943 [Document 1]. Not reasoning like a revisionist, it seemed to him that this document, backed up and authenticated by the testimony of survivors and of the SS themselves, would suffice. It was in fact the only material “criminal proof” that he had available. 1t was effective, and Faurisson was never able to produce a valid counter-explanation, only very weak arguments bordering on the foolish. Neither Wellers nor, fortunately, Faurisson, were aware that the “slip” contained in this letter, as it was presented in 1978, was historically unusable because incomplete. It lacked Kurt Prüfer's clarifying report, unknown in France at the time, but found subsequently in the Auschwitz. Museum Archives [Documents 2 and 2a]. d) The only remaining Leichenkeller, designated by Bischoff as the Vergassungskeller, is therefore Leichenkeller 1. His letter means above all that it is to not be used for the moment as a “gassing cellar”, but as a “corpse cellar”, i.e. a “morgue”. 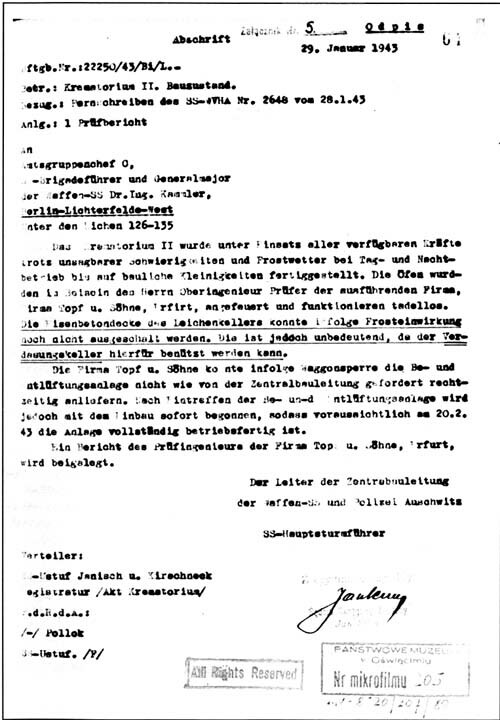 e) The letter shows that the SS called Leichenkeller 1 of Krematorium II the Vergassungskeller / gassing cellar. The existence of a gas chamber in the basement of Krematorium II is thus proven, BUT THAT IS ALL. It is not until this “slip” is compared with and united with others, that the evidence that this was in fact a homicidal gas chamber becomes overwhelming.